Developer and musician Stephen Coyle just released a new app that enables hands-free page turning of PDFs via facial expressions. The aptly-named PageTurn utilizes the power of the TrueDepth camera system found in all iOS devices that support Face ID – the iPhone X, XR, XS, and XS Max, plus the 2018 iPad Pros – to enable turning pages of a PDF using only your face. There are two options of facial gestures available to control page turning: mouth control, which is the default, or wink control. Mouth control works by tracking the movement of your mouth: if you move it right, you'll advance forward a page, while moving it left goes back a page. Wink control advances forward with a right wink, and goes back with a left wink. With both of these options, PageTurn provides the ability to set sensitivity so you can customize each gesture to whatever's most comfortable for you. It feels odd at first making these gestures to turn pages, but in my experience it quickly became comfortable. 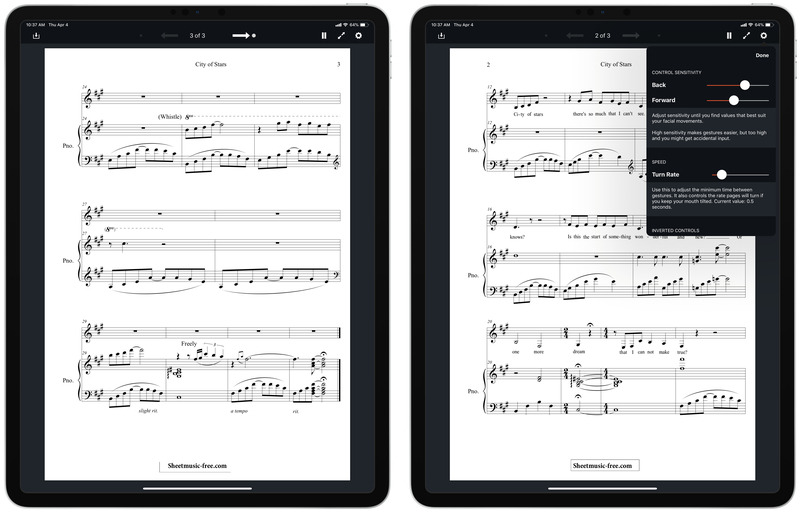 PageTurn was designed primarily for musicians, who often bear the unenviable task of turning pages of sheet music while both their hands are occupied playing an instrument. It works with any PDF though, so readers can have hands-free page navigation as well. You can get PDFs into the app via the import button in the upper-left corner, which opens a Files picker, or if you have a PDF open in another app, you can copy it to PageTurn using the share sheet. PageTurn is a simple utility, but for those who could benefit from it – musicians in particular, and also users with accessibility needs – it's a potentially revolutionary tool that enables new ways of doing a common task that weren't previously possible. The app is a shining example of the creativity of indie developers. As Federico and I discussed on AppStories this week, PDFs are a big part of the work day for many people. 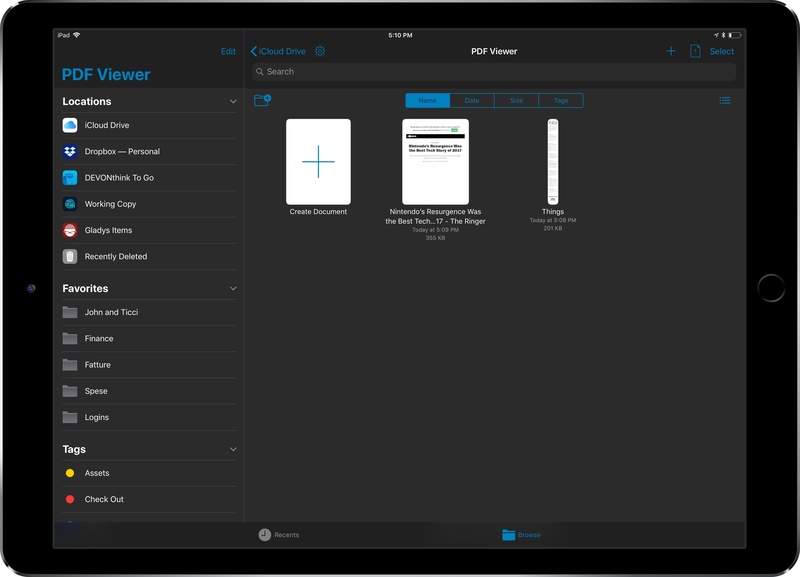 There are several solid PDF apps for iOS, but one of my favorites is PDF Viewer by PSPDFKit, the maker of a PDF viewing and editing SDK that many well-known companies use to integrate PDF functionality into their apps. One of PDF Viewer’s advantages is that it’s free. With version 3, PDF Viewer’s core functionality remains free, but it is introducing a Pro Pack that is a set of advanced features available as part of a $9.99/year or $2.99/3-month subscription. It’s a savvy move and one that’s been well-executed. By first building a free PDF app with functionality that rivals established paid apps, PDF Viewer has made a name for itself in a crowded market. The broad feature set of the free version of PDF Viewer, which we’ve covered in the past here, here, and here makes it hard for someone to argue that the app is only useful if you pay for the In-App Purchase. That’s just not the case. If you work with PDFs every day, you’ll love the new pro features, but the app’s free version still serves more casual users as well as ever. Since the release of iOS 11, I haven't seen many apps use the system's new document browser – the built-in Files view that can be embedded in document-based apps as a root view. I covered this feature extensively in my iOS 11 review. Apple's iWork suite of apps has switched to Files' document browser, as did MindNode 5, but I've struggled to find other examples of high-profile third-party apps abandoning their custom file managers in favor of Apple's solution. As I argued in September, my guess is that a combination of bugs and lack of deeper customization for the document browser is preventing more apps from embracing it. Which is too bad, as the Files integration brings substantial benefits in the form of drag and drop, iCloud Drive and third-party locations, recents and tags, and more. PDF Viewer, the powerful PDF editor for iOS we originally reviewed here and here, is adding support for iOS 11's document browser with version 2.1, launching today on the App Store. After testing a beta of this update for the past week, I'm impressed by how the folks at PSPDFKit have been able to fine-tune the document browser to the app's needs. 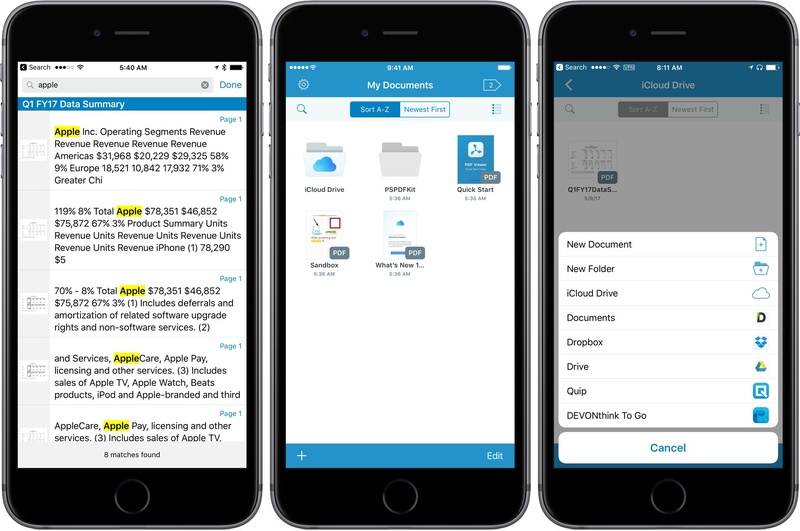 Last fall, PSPDFKit introduced PDF Viewer, a powerful, free iOS app for viewing and annotating PDFs that matched or exceeded many of the features found in paid PDF apps. Since then, the team behind PDF Viewer has rolled out a steady series updates, adding new features and refining existing ones. The latest update continues that trend with major additions that round out PDF Viewer's feature set. 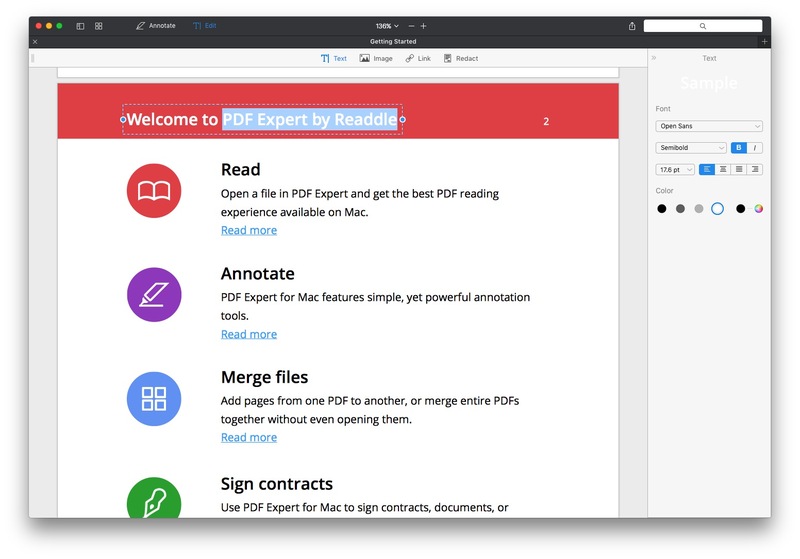 Readdle released a major update to PDF Expert today. Version 6 incorporates powerful PDF editing tools, in-place cloud-based editing and annotation, document-level assignment of passwords, and more. 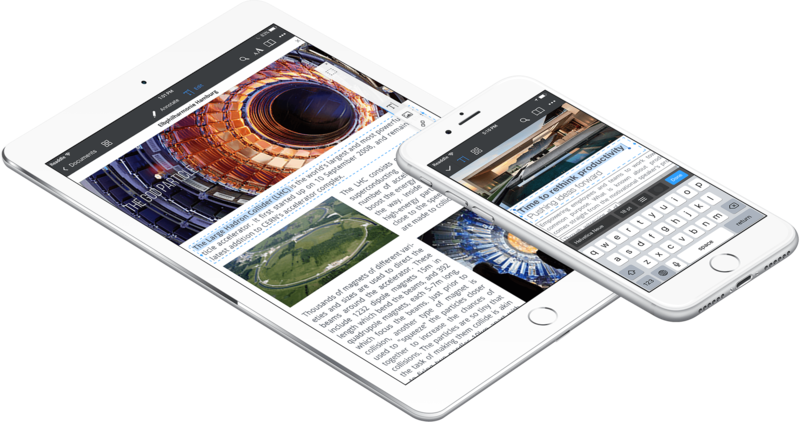 PDF Expert was already one of the premier PDF apps on iOS, but free alternatives have given it a run for its money recently. The new features in PDF Expert 6 should help maintain its status as a favorite for many PDF power users. After macOS Sierra was released, reports of problems with PDFs created with Fujitsu’s ScanSnap scanner surfaced. Apple resolved those problems with the release of macOS 10.12.1, but it turns out the problems with PDFs on Sierra run deeper. Adam Engst of TidBITS has a rundown of several issues that plague Preview, Apple’s PDF app, and many third-party PDF apps. The source of the problems seems to be PDFKit, a developer framework for handling PDFs in macOS. According to developers who spoke to Engst, Apple rewrote parts of PDFKit to unify the macOS and iOS PDF code bases. In the process, developers say that Apple introduced a series of significant bugs and deprecated PDFKit features that broke third-party apps that use PDFKit. Most recently, the macOS 10.12.2 release seems to have introduced a Preview bug that deletes any OCR layer embedded in a PDF that is edited in Preview. Meanwhile, third-party developers have run into new bugs that affect the handling of PDF annotations. … I have to recommend that Sierra users avoid using Preview to edit PDF documents until Apple fixes these bugs. If editing a PDF in Preview in unavoidable, be sure to work only on a copy of the file and retain the original in case editing introduces corruption of any sort. Smile’s PDFpen [which doesn’t use PDFKit] is the obvious alternative for PDF manipulation of all sorts (and for documentation, we have “Take Control of PDFpen 8” too), although Adobe’s Acrobat DC is also an option, albeit an expensive one. PDF Viewer's name belies the power under its hood. This is more than just a viewer app. PDF Viewer includes powerful PDF editing tools on par with, and in some cases more extensive than, some of the best PDF apps I’ve tried. That's not to say that there aren't a few rough edges and limitations, but for a free app, PDF Viewer should suit the PDF viewing and editing needs of most people. PDF Expert launched on the Mac last November, and in my initial review I was pretty effusive, impressed at the level of functionality, polish, and speed for an initial release. At the time I even called it "a better Preview for PDFs", and had made PDF Expert the default application for viewing PDFs on my Mac. Nine months later, and it all still rings true. Better yet, Readdle is today launching a big version 2 update for PDF Expert which makes it an even better and more powerful app. Now you can now edit text, images, and outlines in PDFs, as well as password-protect your PDFs in PDF Expert 2. While I don't work with a lot of PDFs for what I do at MacStories, I've had to annotate documents and collect research material in the past, and I've been impressed with LiquidText for iPad. 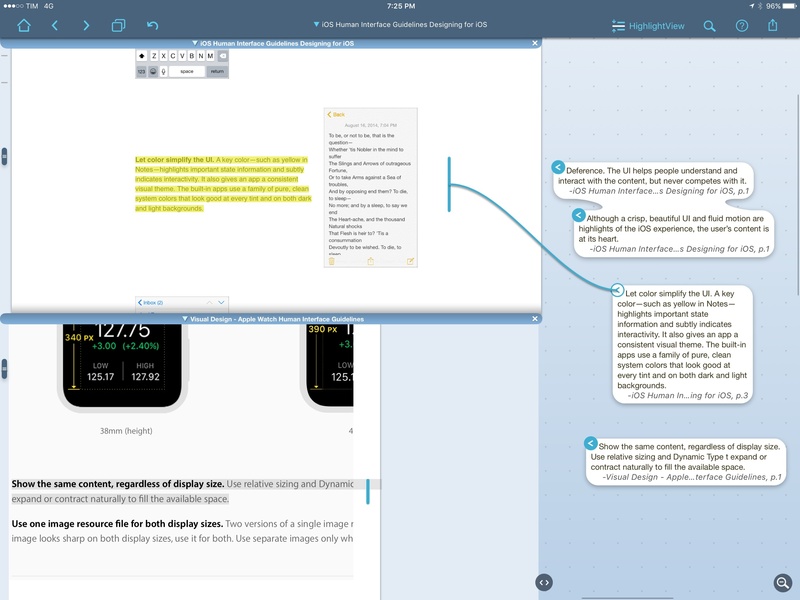 LiquidText is one of the most innovative iPad apps I've seen in recent years. The app lets you read and annotate PDF documents, but it looks nothing like a traditional PDF editor. Text can be highlighted and pulled aside with a delightful tap & hold interaction; multiple excerpts can be grouped together in a cluster of bits of text, and you can also add your own notes to the mix. LiquidText is uniquely spatial in the way it lets you organize notes and annotations visually, moving them around, and linking them together. I like, for instance, how you can tap an excerpt in the side panel to see where it links back in the original document. LiquidText is full of interesting, useful features like that. Today, LiquidText has launched a major 2.0 update that adds the ability to work with multiple documents and easily import webpages in a single LiquidText file. I've been playing with the beta, and it's solid: multiple documents can be opened simultaneously, and you can pull together annotations from different sources in the same space. You can also add notes that reference multiple documents, as well as search for text across all documents at once. I've never seen a PDF app for iPad that made annotating and referencing multiple PDF documents this simple and intuitive. Given the option to import PDF documents and webpages in a single LiquidText file, I think I'm going to give this a shot as I prepare my research for iOS 10 this summer. LiquidText 2.0 can export every excerpt and note as plain text, which I should be able to import in Ulysses to start writing. I haven't tried importing Apple's developer documentation webpages in the app yet, but it should be possible. LiquidText's annotation engine and option to compare files is perfect for that kind of research spread across multiple topics related to each other. Finally, the upgrade price. LiquidText has always been free (which is crazy if you ask me), but the Multi-Document Pack is a $8.99 In-App Purchase. If you want to support and enjoy one of the most powerful, original iPad apps I've tried in years, it's a no-brainer.